Six more working days before we leave for our cross-country trip. The anticipation is exhausting. My brother and I have agonized about the packing, the equipment, the route and the bikes. I have pretty much everything ready to go, my list of equipment is made and my camping equipment is packed. I have some final packing to do, mostly clothes and electronic equipment. I have to make sure I have all the chargers and adapters for the communication equipment, cameras, computer and phone. 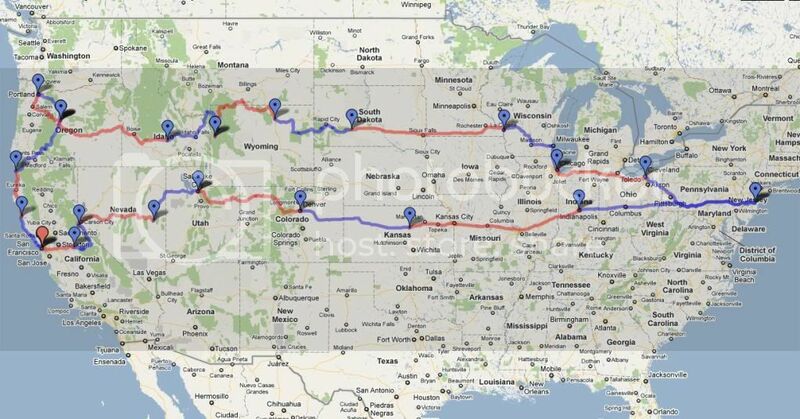 The route is planned to maximize traveling through National Parks, National Forests and the famous "Loneliest Road in America", route 50 in Nevada. There will be plenty photos taken across this beautiful land. I have been to San Francisco, it's a wonderful city, but I have never crossed the Golden Gate Bridge. We plan on leaving San Francisco through the Golden Gate Bridge and head north on Route 1. We will be crossing many mountain passes, interesting places and towns, there will be many lonely roads as well as the occasional rain storm but in the end that's what adventures are all about. What a great trip! You will have a great time. When will you be in Yellowstone. I leave from Texas on July 10th heading to Yellowstone. Looks like it's going to be a lekker* long ride! I enjoy the planning stage, the packing and the preparations are an exciting build up to the trip. Enjoy - and I look forward to reading about it. * an Afrikaans/South African word meaning anything from good to fantastic.